Ampthill completed their first half of league fixtures with victory in a high-scoring game on Saturday. The 52-33 win at Broadstreet sees them well clear in second in National League 2 North and right on the coattails of leaders Hull Ionians with 13 wins from 15 games. On Saturday fly half Joseph Tarrant scored 27 points with two tries, seven conversions and a penalty goal. Open side flanker Joseph Bercis added a hat-trick of tries while loosehead prop Joseph Sproston managed a brace in a topsy turvy game. Indeed Broadstreet had as much, if not more, of the play as the visitors. Novovirus had swept through the squad forcing changes right up to game morning with several stepping up from the 1881’s while others played despite feeling rough. 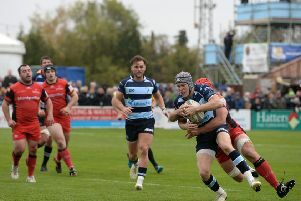 Amps’ early lead from Tarrant’s first try was soon cancelled out by Broadstreet before the game saw a lengthy stoppage for an injury to Ampthill’s experienced centre Jonathan Raven which required an ambulance. On the restart Tarrant scored his second solo try only for the hosts to retake the lead. However A’s pack turned the screw with Bercis securing the first of three trade mark catch and drive tries. With penalty goals for both sides and a second Bercis try the score was 31-21 to Amps at half time. The first 20 minutes of the second half saw the visitors’ defence shut down the hosts attack. Bercis sealed his hat-trick with another catch and drive wide before loosehead Sproston was driven over the whitewash from close range. Broadstreet struck twice in three minutes but the visitors’ Sproston, now playing at number 8, dived over after a 5m scrummage for a knock on in front of the posts. Amps head to Leicester Lions on Saturday.